I am a bit of a late bloomer with regards to most things beauty-related. If I’d known about all the benefits of a BB cream, I would have tried them sooner. The latest addition to the POND’S range promises to even out skin tone and has an SPF30+, making the POND’S FLAWLESS RADIANCE BB Cream a must have for me. It is available in two shades (beige and chocolate) and I hesitantly tried the chocolate (not sure if it was going to be a milky bar or bar one chocolate). Don’t be put off by the darkness of the cream. It smooths on easily, leaves no oily residue and gives good (not great) all over coverage. I was impressed that it was developed specifically for African skins (thus taking into account our climate) and noticed that an added bonus was that it seemed to make my eye shadow and blusher last longer. The bright pink and silver packaging and budget-friendly price of R89.99 gives it added appeal. This is the third BB cream in my make up kit that I’ve tried in three months and it’s definitely the one that I’m hanging on to. I am an ardent fan of POND’S products and have been using their entire Flawless Radiance range for a while. As someone that is completely intimidated by foundation, plagued by insecurities of skin tone matching (and not looking like my skin is suffocating), I was very excited at the prospect of a ‘foundation’ that is embedded in a face cream by the brand I love! I was impressed by the shiny metallic pink tube that is in line with the look and feel of the rest of the range. What was surprising though is the amount of air in the tube – I had to squeeze it about as much as I would squeeze a two-week old lip gloss to get some product out. The texture was velvety and it smells amazing so I was all too happy to smear it on my face. Speaking of smearing, unlike foundations that can look like plaster on your face, it was such a relief to see that it applies like a cream and the colour is gradual. I still cannot fathom how one shade (Chocolate) seemingly works for every different shade of dark skin. To test this, I had a few of my friends of varying complexion try it too. It blended seamlessly on all of us. Amazing. It created a ‘fresh-faced’ appearance on my face and a bit of mascara and some lip gloss is all I needed to complement it and step out confidently in the light of day. Because I have oily skin I found it highlighted the oilier parts of my face like my nose, so once or twice in the day I would have to wipe it down and reapply. This is a minor hindrance for a product that delivered on its promise at every level. I was quiet excited to try this product as there has been lots of talk recently about the various BB creams available. I liked the look of the tube, but that could be because it has a funky pink design on it. It also fits comfortably in your hand due to its thin streamlined shape, and this also makes it convenient to carry in your handbag. It has a snap screw cap, which ensures it is properly sealed after each use. It has quite a neutral smell and isn’t overpowering. I started by applying a small amount to my cheek and found that it is absorbed quickly – this means you have to use quite a lot to cover your face. I was impressed at the cover it gave me as it blended very well with my skin tone and gave my face an even glow, so no need for a foundation. Not only did it provide great cover but I felt like my skin was well moisturised. It had made good on its promise so far. I had six hours of complete coverage without needing any touch-up’s. Then came the next day – even though I had washed my face before going to bed, when I woke up the next morning my skin had broken out in blemishes like a teenager with acne. I have a pretty normal skin and don’t often have problems with skin care products, but there is obviously something in this BB cream that doesn’t agree with my skin. After just a few hours of use I would say that I wouldn’t use POND’S again simply because it doesn’t agree with my skin. Having said that I was impressed with it up until the morning after, it did exactly what it is advertised to do. There are so many beauty products on the market nowadays that when I consider finding something specific for my face, I am so overwhelmed and end up with nothing. The first thing that caught my eye about the POND’S BB cream is the fact that the packaging is so attractive and the container is small enough to fit into my handbag. Being a typical skeptic about facial products in general, this BB cream truly surprised me! Firstly it has the lightest, creamiest texture ever and once applied to the face, it immediately blends into the skin. The faint smell is ideal, as I only ever smell it once I’ve applied it and then there is no after-smell like with many other facial products. In the beginning I was worried about how much to use, as I didn’t want my face to glow too much or my skin to be darker than it naturally is, but after two days I found my ideal amount. POND’S BB cream definitely exceeded my expectations as it gives my face the overall even tone it requires (as I struggle with white spots) and translates so lightly that I am still able to use my blush. A natural, fresh look is all I need to boost my confidence and now with Pond’s BB cream I am able to achieve just that. When I first received this, I immediately felt that Chocolate was too dark for my skin. But, it promises to adjust to the tone of your skin, so I tried it very skeptically. Imagine my surprise when I found it blended into my medium skin just perfectly! But at R99 for just 25ml, I still needed convincing. It hydrates instantly and has a lovely scent. It does adjust to your natural skin tone. It doesn’t offer much in the way of coverage, but a little concealer and powder will set the look, if necessary. My skin really does appear smoother and more refined after almost a week. The small nozzle is convenient as there is no wasting the precious cream. It is quite expensive to be honest, but when compared to other more economical BB creams, I find this is far superior in that it does deliver what it promises. The marks I do have do actually appear lighter, so that is a huge plus! And with the benefit of the sunscreen, it makes this an awesome all-in-one package. Definitely a winner in my books! I was very excited when they sent me the new POND’S BB cream. The tube is eye-catching and stylish, with a small nozzle that prevents any wastage. It has a lovely fresh smell, which seems to be common among BB creams. I tried the POND’S Flawless Radiance BB cream in Chocolate, which I think was slightly too dark on my medium skin, so I did not wear it outside. The formula feels light, non-sticky and much like a regular cream on my face. Throughout the day, my skin felt soft, moisturised and deliciously fragrant. However, the cover was very minimal. This product does not hide redness, acne scars or dark circles. It is more of a tinted moisturiser than a BB cream. I also found it difficult to remove afterwards. Other than its smooth texture, non-greasiness, lovely smell and pretty pink packaging (which only contains 25ml), there is nothing special about POND’S BB cream. I might as well buy a moisturiser. The sign of a great marketing campaign is when consumers want to try and own a product, even though they’re not a fan of the brand. This was how I became in possession of the POND’S Flawless Radiance BB Cream. Now, don’t get me wrong, POND’S is a great brand. But its products just aren’t for my skin – no matter how crazy I am about BB Creams. Sadly it burnt my face (which is your skin’s way of telling you that the pH balance of the product isn’t the same as your skin) and just didn’t let up, even after a couple of days. 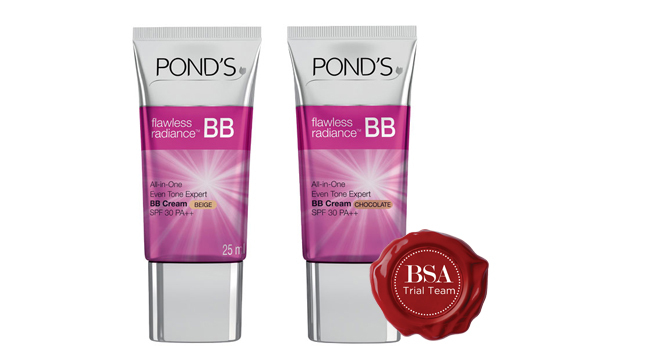 However, if you’re already a POND’S user and love the brand, then definitely give the Flawless Radiance BB Cream a try. The application is effortless as the product’s consistency is smooth and creamy. It offers light non-sticky coverage and will be great once summer comes around again. While the POND’S BB cream is a great cover-up and leaves your skin looking matte and almost airbrushed, I wouldn’t recommend it for dry skin. It dispenses a good amount (no wastage) and does a really good job of covering up blemishes and spots – the thickness of the cream also ensures that you don’t have to use a whole lot and it blends in easily. There’s no weird smell and the consistency is great. Just a tip: If you have very dry skin, maybe lather on some moisturiser first.